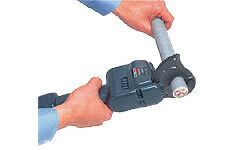 REC-33 Battery Operated Tools: Izumi Products. 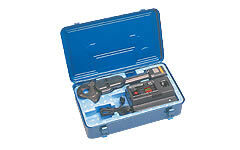 The REC-33 was designed to cut copper and aluminium cables up to 33 mm. Small and light weight REC-33 is suitable for electric work where maximum size of cable is less than 33 mm. Just a squeeze of rocker arm trigger is all it takes to cut your toughest copper cable. There are two cutting modes for types of cables. HIGH : Faster speed with less cutting power. LOW : Slower speed with maximum cutting power. When overloaded, mechanical clutch functions and disengages the drive gear for overloading protection. Soft copper cable IV150mm2 (14mm OD) 70 cuts High mode.